P1167. 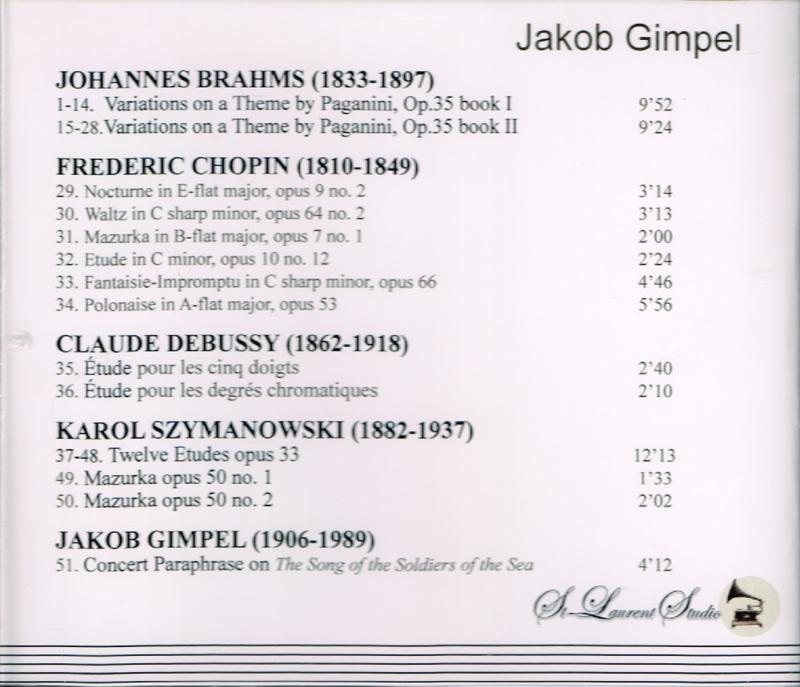 JAKOB GIMPEL: Brahms, Chopin, Debussy, Szymanowski & Gimpel. (Canada) St Laurent Studio YSL 78-255, recorded 1940-46, Co-Art, Columbia & Vox. Transfers by Yves St Laurent. “Culled from Armed Forces Radio Service on Vox shellacs, 1942-1946, the legacy of pianist Jakob Gimpel (1906-1989) finds restoration through the Yves St-Laurent Studio label, performances rife with grand excitement in spite of their original 78 rpm surface swish and crackle. Gimpel emigrated to America in 1938, but spare recognition sent him to Hollywood in 1943, where his playing received more note in the movie ABOVE SUSPICION as the unseen performer of the Liszt E-flat Concerto. His participation in the New York segment of the 1949 Chopin centennial gleaned him international recognition, as well concert appearances with major orchestras. A pupil of Cornelia Tarnowska, Edward Steuermann, and Alban Berg, Gimpel possessed a refined sound and an exquisite sense of musical architecture, and these surviving archives testify to a fluent command of his repertory. The opening Paraphrase on the MARINE CORPS HYMN should convince anyone of Gimpel’s fleet powers of improvisation in wicked octave runs, rather Lisztian in character, or perhaps the Marines by way of Balakirev’s ISLAMEY. The Chopin Ballade in g Minor derives from the same Armed Forces issue, a performance much in the grand Polish tradition, its style innate attentive to the ferocious balance of forces Neapolitan and declamatory after the poetic narrative of Adam Mickiewicz. The sheer bravura of the last pages should sweep any doubts of Gimpel’s virtuoso powers into the sea. [In these] Vox recordings (from sets Vox 164 and Vox 608)…the Liszt ’Waldesrauschen’ presents the Liszt acolyte on a diaphanously bravura scale with Bolet, Kentner, and Horowitz; and recall, Gimpel provided the keyboard playing for the Alan Alda (via Ira Levin) classic film MEPHISTO WALTZ. Gieseking once called the Debussy Etudes the most challenging studies in the repertory, but Gimpel moves them in their exotic, stunningly rapid harmony and colors without a misstep. That for ‘les cinq doigts’, the first of the entire set, accomplishes a world of piano development within a three-minute frame that has managed to explode with competing colored runs. 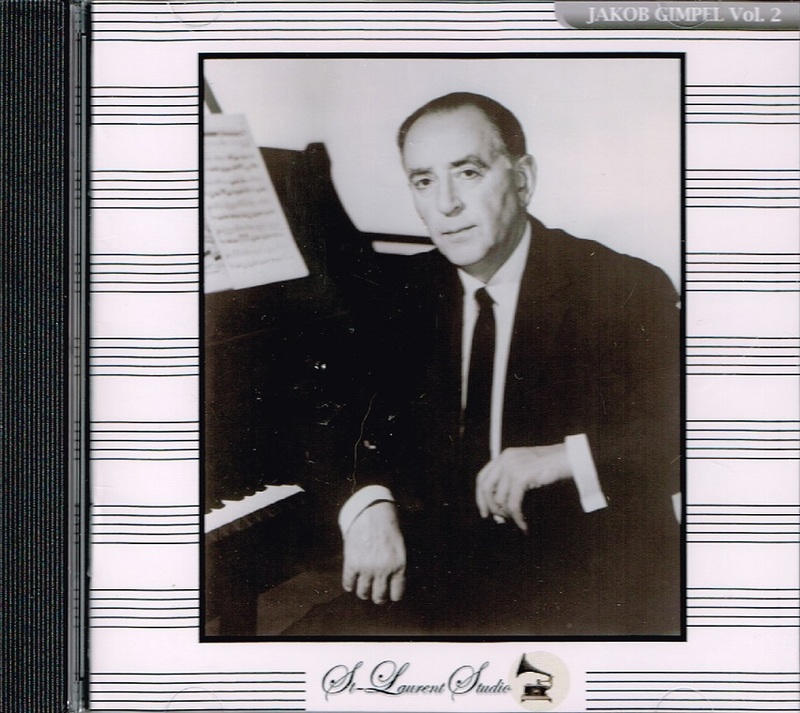 The last eight pieces devote themselves (1944-1946) to perennially nostalgic Rachmaninov, including solo melodic riffs from the outer movements of the c minor Concerto and a most persuasive Variation 18 from the PAGANINI RHAPSODY. Russian bells permeate the Prelude in g-sharp Minor, Op. 32, No. 12. The ubiquitous c-sharp Minor progresses without exaggerated histrionics, but its sober efficiency yet conveys an abyss of moody obsession. Gimpel rivals Moiséiwitsch for the sparkling, gently Empyrean magic of the G Major Prelude, Op. 32, No. 5, a waterfall of colors. The old Hofmann warhorse, the g Minor Prelude, Op. 23, No. 5 concludes the Rachmaninov group, its militant outer sections’ enfolding a trio of exalted voice-leading. Never do the martial aspects assume a percussive quality, only a resolve tempered by a master’s control of pedal and incisive accents. 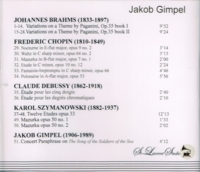 “Jakob Gimpel, a concert pianist known for his interpretations of Chopin, was born in 1906 in Lvov, Poland, which is now part of the Soviet Union. He received his earliest musical training from his father, Adolph, and later studied in Vienna with Alban Berg and Eduard Steuermann. He made his début in Vienna in 1923. In 1935, Mr. Gimpel met the violinist Bronislaw Huberman, with whom he toured the world and with whom he helped, in 1937, to found the Palestine Symphony, now the Israel Philharmonic. Mr. Gimpel immigrated to the United States in 1938, settling first in New York and, a year later, in Los Angeles. There he had a long teaching and performing career that included numerous solo and orchestral engagements. He also appeared in several motion pictures, including GASLIGHT, and recorded the soundtrack for MEPHISTO WALTZ and other films. In 1971 he became Distinguished Professor in Residence at California State University at Northridge.